Change it or ABOLISH IT! What are you talking about? I googled the terms Indonesia and Priscilla (because that's what I do when I encounter a subject I'm unfamiliar with and am curious about), but all I found were people named Priscilla. (Some were profiles of people from Indonesia, some were articles about Indonesia with authors named Priscilla) but nothing about a system, custom, heiarcy, etc. that is called Priscilla that is biased. Oops, I probably meant "Pascilla"
I think you meant "Pancasila"
Basically you're saying you object to religion bring a principle in government, because it discriminates against non-believers. Not necessarily. The Pancasila doesn't just not officially recognize irreligion, but is biased toward monotheism as well(it states belief in only one God as part of the the first principle) thus it ignores religions such as Hinduism and Buddhism's polytheism and non-theistic nature, respectively. It also does not recognize Judaism, Sikhism, and the pre-Hindu ancient religious beliefs that some Indonesians still believe in in one form or another(these are often animistic) Don't get me started on the Crony "social Justice" part of it. 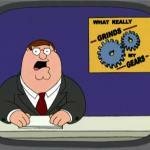 YOU KNOW WHAT GRINDS MY GEARS? 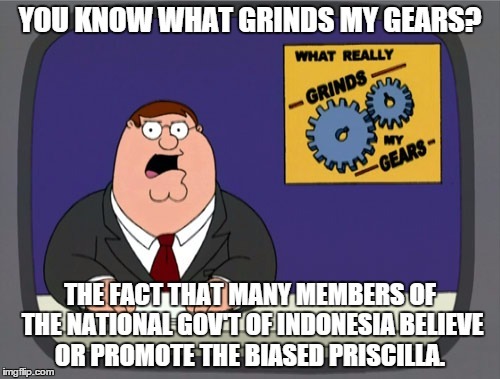 THE FACT THAT MANY MEMBERS OF THE NATIONAL GOV'T OF INDONESIA BELIEVE OR PROMOTE THE BIASED PRISCILLA.